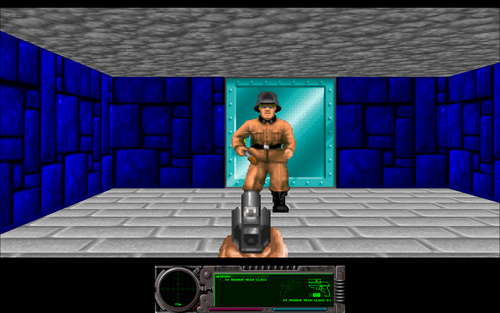 In 1994 Macplay released Wolfenstein 3D for the Macintosh. 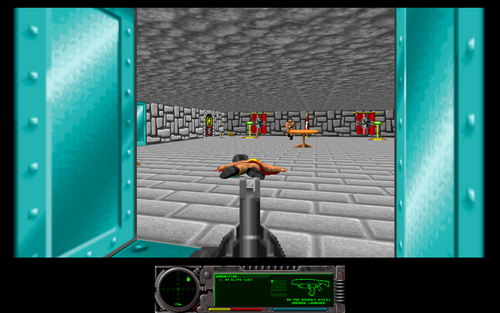 In 1996 Bungie released Marathon Infinity. In 2009, a mod was made that put some Wolfenstein 3D in Marathon. So here you have it. This mod was mainly meant as practice at making a mod for the Marathon engine, but I figured that I would release it for other people’s pleasure as well. It consists of only the first level of the game converted over with most of the graphics and as close of gameplay as I could muster to the real deal. A video of the mod in action for your viewing pleasure. UPDATE - JULY 2010: Released version 1.01 that corrects some issues and adds more authentic gameplay. Release notes included in the Readme. You can download the mod at the link below, included with it are instructions for installation. Use them if you are interested in making adjustments or adding onto the mod in your own way. Lastly, if you like what you played here, I suggest playing/buying the real game. Thanks for sharing the new game Wolfenstein 3D with us.can you tell me from where i can collect this game?that will be a great help.